To alleviate the pressing financial burden of the ever-increasing cost of living in New York City, many alumni and non-alumni have supported Cooper Union students by establishing named scholarships and fellowships. The income generated by these special funds offers vital support to deserving students. General Financial Aid Scholarships Irwin & Lillian Appel; H. Carl Bauman; Robert C. Bosch; Julius Dingenthal; Edward Durbin; Kathleen Gerla; Mindy & Drew Greenwald; Alexander C. Grove; Salvatore & Tina Guzzardi; Julian Hirsch; Marilyn Hoffner; Dr. Peter Kabasakalian; Estelle & Daniel Maggin; Vincent P. Malahan; William H. Okun; Nathan G. Ramer; Michael A. Rampino; Benjamin Reich; Charles Lowery Robertson; William H. Sandholm; Louis Schmidt; Emil Schweinberg; Allen Speiser; The Starr Foundation; Charles Stumpp; Solon E. Summerfield Foundation; Arlene and Irving Tashlick; Clifford Warren; Bert Weinstein. The Irwin S. Chanin School of Architecture Gus J.& Helen Condaris; Ismar David; Manuel & Flora Fernandez; John Q. Hejduk; George & Selma Klett; John Loeb & Frances Loeb; Mari Souval Spacedrafting Foundation. 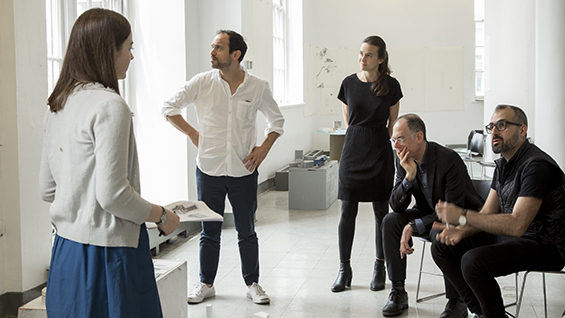 The William Cooper Mack Thesis Fellowship program was established in 2008 by John and Harriet Mack at The Irwin S. Chanin School of Architecture in memory of their son William Cooper Mack, class of 2006. Cooper, as he was known to all, first entered The Cooper Union in the School of Art, where he studied for one year before transferring to the School of Architecture. His work to weld tradition and research, technology and science, art and architectonics in the search for new answers to longstanding questions in architecture was recognized through awards and prizes that included the American Institute of Architects Henry Adams Certificate of Merit, the Peter W. Bruder Memorial Fund Structures Prize and the Bert L. Stern Architectural Award from the Lotos Club Foundation. The Thesis year affords each student in the School of Architecture the freedom to shape, in every sense, a project that stands as a culmination of the design sequence. Thesis students are encouraged to deeply examine personal as well as broad cultural, social and environmental concerns toward an architectural solution incorporating program, site, technologies and poetics. William Cooper Mack Thesis Fellowships are awarded each year to support primary research and inquiry in the development of significant and original thesis projects. Irma Giustino Weiss Prize for exceptional creative potential in architecture or art, endowed in 2002 by Cooper Union alumna Irma Giustino Weiss (A45). The Toni and David Yarnell Merit Award of Excellence in Architecture, presented to a graduating student who demonstrates exceptional ability and outstanding merit. The Snarkitecture Commencement Prize, to a graduating student from the School of Architecture or Art who demonstrates a committed interest in exploring the peripheries of their discipline in pursuit of the unexpected. Snarkitecture is a collaborative practice established in 2008 by Daniel Arsham (A'03) and Alex Mustonen (AR'05). Edwin Sharp Burdell Award, to that member of The Cooper Union community who during the past year has done most to further the mutuality of science and art. The American Institute of Architects Henry Adams Medal and Certificate of Merit, to one graduate who has displayed excellence throughout his/her academic career. Alpha Rho Chi (National Professional Architectural Fraternity) Medal, to a graduating student who has shown an ability for leadership, who has performed willing service for his or her school or department and who gives promise of real professional merit. The Cooper Union Alumni Association Annual Award, to a graduating student for outstanding service to the school. The Abraham E. Kazan Award for Urban Design was established in 1965 by Co-Op Village in honor of Mr. Kazan, recognized as the father of non-profit cooperative housing programs. This is given to a graduating student for outstanding performance in urban design. George Ledlie Prize, to a graduating student as selected by the dean. Peter W. Bruder Memorial Prize, to a graduating student for excellence in structures. Allen N. Goldfischer Memorial Award, for a graduating student whose thesis project best explores relationships between humanistic and aesthetic principals in an urban context. This fund was established in 2004.